Delicious and rich malai koftas with the stuffing of dry fruits... a dish to die for. Ginger-garlic paste .... 1 tsp. 1. In a pan, fry the onions to a golden brown colour. 2. Add ginger-garlic paste and 1 cup water and simmer it to cook. 3. Let it cool and then grind it. 4. Take the milk powder in a big vessel, add about 1 litre water and let it boil. 5. Add the vinegar and let it curdle. Strain the paneer well and let it cool. 6. Now mix the paneer, boiled potato, breadcrumbs and salt.Mash it well. 7. Chop a few almonds, pistachios and raisins. 8. Take a little portion on your palm, flatten it and fill with the chopped nuts and roll them in a round or long shape. 9. Deep fry the koftas. 10. Grind the almond and cashews to a smooth paste adding 1 cup water. 11. Take a pan, add a little oil and fry the ground mixture and the onion paste. Saute and add the tomato puree.Simmer for 2-3 minutes, stirring in between. 12. Stir in the cream and sprinkle the garam masala and kasoori methi powder. 13. Just before serving set the koftas in a flat dish and pour the gravy over them. So rich & creamy ... delicious Malai Kofta!!! this looks great.. making paneer from milk powder!!!!!! never thought about it....must try this out..
Hi Shobha, The koftas are looking absolutely delightful. Very nicely made and presented. Saving this recipe of urs and wud love to give ur version a try on the coming weekend. Have a great day ...Regards, Sonia !!! you made paneer from milk powder ? Wow... koftas look finger licking good. 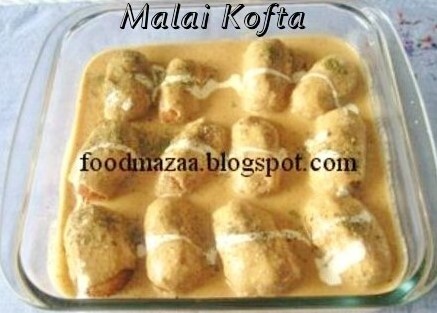 Malai kofta is one of my favorite dishes and looks yum.